Artist's illustration of the presumed view from the surface of the "hot Earth" alien planet Kepler-10b. Hot Earths — scorched, Earth-size worlds that are closer to their stars than Mercury is to the sun — may often be lonely planets, either far removed from any other worlds or the only planets in their systems, a new study finds. 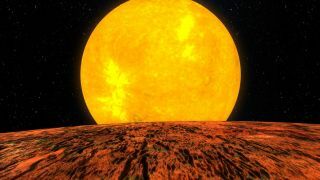 These isolated hot Earths may be the charred remnants of much-larger worlds, or they may be exoplanets whose interactions with massive disks of gas and dust dragged them perilously close to their stars, researchers said. Exoplanetary systems also often differ from Earth's solar system in their so-called architecture, or how close alien worlds' orbits are to each other and their stars. For example, a number of exoplanetary systems either consist of a single planet or have a planet that is extremely isolated from its siblings. "In the solar system, and among most of the planetary systems discovered by Kepler, planets tend to be pretty close together," said study lead author Jason Steffen, an astronomer at the University of Nevada, Las Vegas. In comparison, if Earth were as solitary as some of these isolated exoplanets, "our nearest neighbor would be beyond the orbit of Saturn," Steffen said. "It takes something unusual to produce such a wide separation between neighboring planets." To uncover clues about why single-planet and multiplanet systems evolved in different ways, scientists analyzed Kepler data on 3,063 candidate exoplanets in 2,373 systems. This included 1,890 candidates in single-planet systems and 1,173 candidates in 483 multiplanet systems. The researchers focused on 144 exoplanet candidates that are hot Earths, worlds whose orbits are so close to their stars that these planets take only about one Earth day to circle their stars. In comparison, Mercury's orbital period, or year, is about 88 days long, while Earth's is the familiar year, or about 365 days long. The researchers estimated that more than one-sixth of these hot Earths are isolated; they are either the only planets around their stars, or they're so distant from their planetary siblings that they're effectively single planets. These isolated hot Earths seem about as common as hot Jupiters, gas giants that orbit their stars closer than Mercury does the sun. "In this way, this kind of result is like finding a new species of plant or animal. It marks a distinct evolutionary path that branched off from our own at some point in the past," Steffen said. "Just as how we can learn a lot about civilization by studying the histories of different nations, we can learn a lot about our solar system by studying the histories of different exoplanetary systems." These isolated hot Earths might come from the leftover cores of hot Jupiters, after these giant worlds have their atmospheres burned off due to their searing proximity to their stars, the researchers said. Hot Jupiters are typically isolated planets, likely because their gravitational pulls disrupted the formation of any nascent planets near them, researchers said. Hot Earths might instead have formed in massive disks of gas and dust, having been originally located farther away from their stars, the researchers said. These disks interact with the planets, making the worlds spiral toward their stars. Eventually, the disks dissipate, and hot Earths are left very near their stars, the researchers said. Previous research suggested that this is why the Kepler-10 system may have a hot Earth and a more distant planet with an orbital period more than 50 times longer. Future research can pinpoint how commonly isolated hot Earths occur and yield more insights as to how these planets might have formed, Steffen said. For instance, NASA's planned Transiting Exoplanet Survey Satellite (TESS) will study stars that are brighter and much closer to Earth than Kepler's target stars; the TESS stars can literally shed more light on any isolated hot Earths around them. "We want to know the answers to questions like, 'How many systems are like these? What other planets, if any, are in these systems, and where do those planets live? Are there any distinguishing properties of the stars that we couldn't see in the Kepler data?'" Steffen said. Steffen and his colleague Jeffrey Coughlin at the SETI Institute in Mountain View, California, detailed their findings online Oct. 10 in the journal Proceedings of the National Academy of Sciences.